As teenagers go to college they become more involved with the party culture. The typical party culture involves binge drinking which they might not be used to. Binge drinking is defined by the The National Institute on Alcohol Abuse as a BAC of 0.08 grams. This can happen when a woman drinks 4 or more drinks or a male drinks 5 drinks in only 2 hours. At big college campuses binge drinking is more common than not. Everywhere you go in college it’s normal to drink excessive amount in short periods of time. In an article online, about 90% of people under the age of 21 admitted to binge drinking. In a study from 1993 that I found while doing research on binge drinking, the scientists were looking to test the extent of binge drinking done by students on college campuses. The experiment was a self designed study as it was a mailed survey. 44% of the students who were question admitted to binge drinking. Almost one fifth of the students admitted to binge drinking frequently. The result of this experiment is that college students drink heavily and sometimes this creates a problem for students who do not condone this. The study was best conducted as a mailed survey because students would be less likely to lie about drinking if under 21. Some faults with this study is that binge drinking although there is a definition it is a soft endpoint term. There is really no definition of what a kid thinks is binge drinking. It varies from student to student. Although some students phase out of binge drinking, others do not. In an article that I found while researching this topic, two girls who were heavy binge drinkers in college had two different paths after college. One of the girls phased out of her drinking habits while the other became a high functioning alcoholic in recovery. While in college the article describes that it is hard for a student to realize that they are developing alcoholic tendencies because everyone around them is doing the same thing. I believe that some of this is hereditary. If you have someone in your family who is a functioning alcoholic and you are surrounded by people like this then you are more likely to become an alcoholic. Another thing that determines if you are is what age you start drinking at. Also the drinking patterns of your social friends can help determine the type of drinking that you partake in. The best way to tell if you are developing these tendencies is to stop drinking and see if you can go out and enjoy yourself without drinking. In college it is fairly normal to binge drink so it is hard to see if you are developing alcoholic traits but its important to notice it before it’s too late. Here is an article to help tell you if you are over doing it with the drinking. Great post, having lived in State College for about half my life now (11 years) I’ve noticed the drinking culture has not changed from when I first moved here. I agree that who you surround your self with does effect your drinking habits. For me it depends on which group of friends I go out with and where we go, such as a bar where you have to pay compared to a frat. I know a few people who go out at least four times a week and still manage to do well in class. Some of which are also on sports teams here, Ive been amazed many times how much they drink and still manage to get up for class and practice. I myself can only handle going out on the weekends, as I don’t think I would be able to function. I don’t think the culture will change, as long as alcohol is so easily available to almost everyone. I was not surprised to hear that binge drinking has many serious consequences. Binge drinking every weekend is clearly going to have some health effects. I thought it was interesting when you talked about how some kids who binge drink in college go on to live normal lives and don’t binge drink when they are older. Although some go on to become alcoholics later in life. I think that if these kids that became alcoholics were never exposed to binge drinking in the first place, maybe they wouldn’t have gone on to become alcoholics. This might not be true, but them being exposed to binge drinking definitely did not help the progression of their alcoholism. 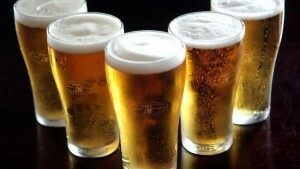 I think that binge drinking is not a good habit to get into because it is not a healthy way to live life. This article interested me because I am surrounded by binge drinking every day of the weekend at school. One thing that you did not mention are the health effects that binge drinking can have on someone. The National Institute of Alcohol Abuse claims that frequent binge drinking is linked to memory loss, impaired vision and even fatal long term effects like cancer and other diseases. What makes binge drinking so dangerous is the large amount of alcohol consumed over the short period of time. With no time to recover, the body begins to deteriorate faster than it would from a normal alcohol consumption pattern.